It seems to me that the segment of society, that advocate for ignoring solving world poverty,creating peace and curing climate change are also the people that would intrude into all my other moral decisions. And does he suggest any kind of alternative? It could be, that Kenneth Minogue confounds democracy with something else. That in the past certain people "sentimentally proclaimed that" the communist "regimes were the wave of the future", and today "assert that Western life is a nightmare of inequality and oppression", has nothing to do with democracy, but everything with stupidity and malice. 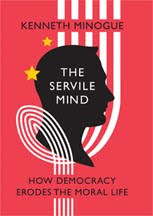 Minogue's "The Servile Mind: How Democracy Erodes the Moral Life" is one more useless book. subserving individual wants to the greater good and working solely for the benefit of the community has been shown to consistently.....completely fail as a model, lead to laziness, corruption, and exploitation. These orwelian "morals" are the basis of communism. when people are selfish and seek higher standards of living, everyone benefits, whether the intention is there or not. to deny the fact that ultimately people do what's in ones own self interest, is to deny reality. Pure altruism does not exist, and worse, if forced leads to subvert man, and to lower standards of living for all. Adam Smith’s invisible hand theory was a step forward at the time he proposed it. It is however not the last word on social or economic thought. Eighteenth century conditions and society were much different than today. Working conditions and environmental standards that we have today are due to the hard fought battles of the working class. Much more needs doing. Adam Smith could not have foreseen hedge funds, derivatives, deep water drilling, nuclear waste, environmental degradation or huge stateless multinational corporations. Unfettered capitalism must be a thing of the past if we are to have a future. Sounds like imperialist propaganda from the quotation. Portraying the West as an Eden for immigrants while acknowledging neither the horrific oppression they face once here nor the role of western policies in prompting immigration in the first place only confuses the matter. I prefer my critiques of authority and submission without the elitism and Euro-supremacy. I don't see the intelligentsia as "in love" with social perfection. As with most schools of thought the object and idea with postulating an "idealized" social condition is to then compare and contrast it with the reality of our social condition. In doing so we can then see where our deficiencies are and begin the dialog on how to fix them. The political arena operates in the same way. We elect officials who hold to certain moral principles. They are then expected to enact legislation and policy that enforce those principles. The reality is that we don't want leaders who are hypocritical in their principles and we largely select platforms, parties, and candidates who align with our preset principles.